A new handbag is one of the coolest ways to refresh a look. I’ve been going through the latest trends to come up with my top 5 picks for this coming season. I have to admit, the new handbag trends have left me wishing for a much higher paycheck! Designers are really pushing the boundaries in this category. Some of my favorite handbag designers, such as Les Petits Joueurs aren’t easy to find in many countries, so I’ve added some links to ease your search. Tip: Read down to the end for a little trick to get 15% discount and free shipping worldwide! Soft hobos are all over the catwalk, with every top luxury maison doing their own interpretation of it. My favorite is the Roxy bag by Alexander Wang. It can be worn in many different ways (I can think of at least 3) and its signature chain gives it distinction. I saw this handbag in Hong Kong and the leather is a very high-quality cowhide. 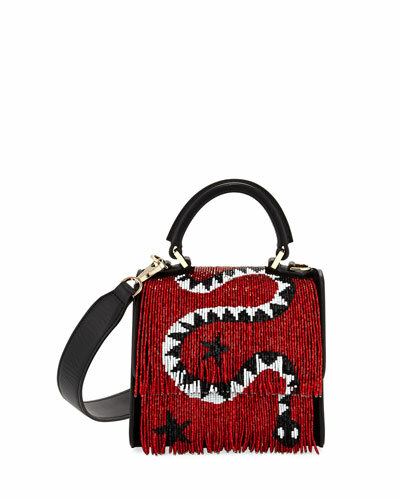 The price before discount is $595 – not bad at all for a bag this size! Let Petit Joueurs is a really fun brand which I love. Out of the 5 must-haves for this season, 2 are from this brand. Maria Sole Cecchi is pure genius and she has a fun and playful approach to luxury. I don’t think you can see in the image but the hardware is gold and the beading is so much fun with a snake and stars! Obviously, this much craftsmanship comes at a price; however, $970 is reasonable for this level of detail. My favorite one! The fluffy pom pom is so cozy it’s almost therapeutic to feel it. 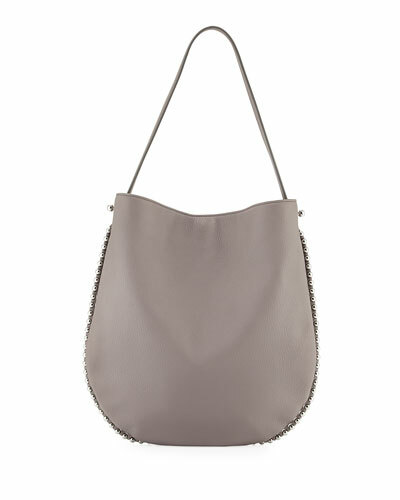 This bag is made in Italy and the removable strap has studs in it. It’s a super cool look that you must have. The price is $730 before discount. Rafe is a super-sophisticated firm that takes inspiration from the city of New York. This kakibe and hammer shell mosaic is wonderful. 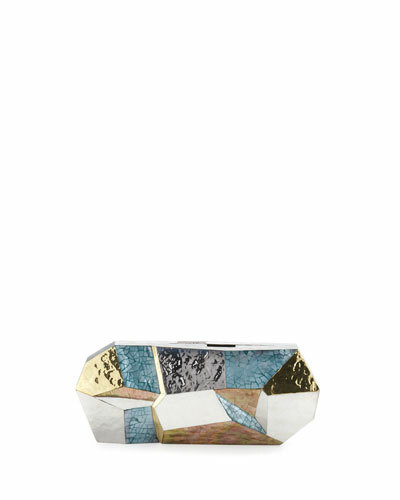 Click the image and enlarge – you will see just how beautiful is this artful minaudiere. The price is $745 before discount. Fendi is one of my top firms for its high creativity and craftsmanship. Before I continue, I have to tell you: this bag is for $2,600 and, even after the discount, I will NEVER in a million years be able to afford it. 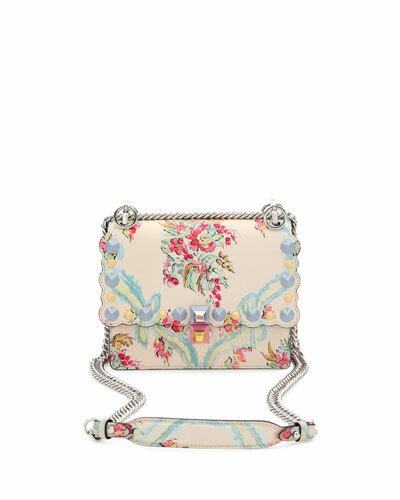 This bag, Kan I, is made in Italy and the leather is printed. The palladium hardware is just beautiful. When you follow the links by clicking the images, scroll down the Neiman Marcos website to the bottom of the page. You will have the possibility to subscribe to the mailing list in exchange for 15% discount on your first order. Not bad! Check it out and let me know which one is your favorite in the comments!